Yep, we are in NYC and happy to announce that the Kehlhof collection will be launching at Design Junction NYC 13–15 May 2016 with new brand AARA Design. The collection includes a side table, coffee table plus bookcase and will be on the AARA Design stand. The show will take place within the warehouse-style ArtBeam venue in New York’s cultural hotspot, Chelsea and is set to be the city’s most vibrant design destination. 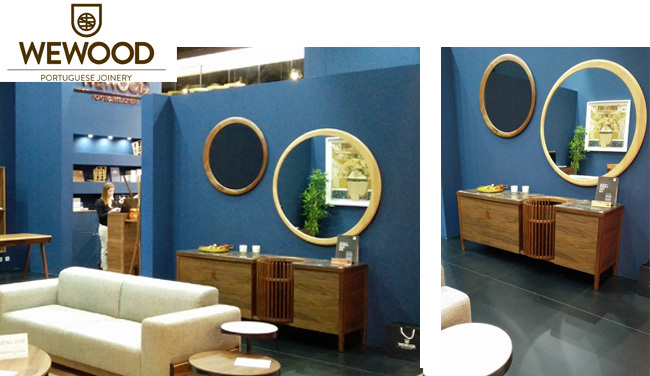 Developed for WEWOOD Portuguese Joinery our new Carousel Sideboard is an understated gesture of modern sophistication. Featuring a solid walnut frame with a stunning marble top, the focal point of the sideboard is its turntable - perfect as a drinks cabinet, or anything which you would like to display. We are excited about some new product launches at this years Salone del Mobile Milano 2016. Our new Carousel Sideboard for WEWOOD Portuguese Joinery and the official launch of the Arco Dining Range and Joan Bookcases for Oliver B Italy. A dining table with lives. "During the week it's restrained, compact and understated. But on the weekend, the table reveals its inner-self, extending to be the center of festivities." Always happy to see one of our gorgeous sideboards being admired, the Chaser sideboard is a popular piece with a colour palette that compliments a huge range of interior settings and colour schemes.